In what is sure to be a long list of “must see TV” stops here at this year’s AXPONA 2019, I want to call out the new PS Audio AN-3 loudspeakers. These speakers have been in the works for many years, which means they’re really not an afterthought, lark, or one-off. PS Audio’s Paul McGowan is deadly serious. And at the target $12-15k/pair price point, his new AN3 loudspeaker prototypes are too. What I heard from these bottom-of-their-line loudspeakers — and please, remember that this was setup day, impromptu, I’m-totally-up-in-their-grill, we’re-not-show-ready condition — was remarkable. Fleshy, voluptuous, full some, room-filling, musical sound. There was plenty of light and air, but even in these lightweight, open-cell, cube-like caverns, the bass was decidedly of the flex-your-chest variety. I’ve clipped the details of the design from the press release (below), so I won’t repeat them here. I will offer that these are the entry point in the AN line, and the range-toppers are targeting pinacle-fi (the Infinity IRS towers, to be precise). Based on this outing alone, I’m actually holding my breath. Powered bass drivers, a planar-mid, and a folded-ribbon tweeter all seem to should viva la difference, but as Grammy used to say, the proof of the pudding is in the eating, and this is a dish I think show-goers are going to keep coming back for. Availability for the PS Audio AN-3 is targeting year-end, with the rest of the AN line to follow in 2020. Details below the fold. The star of the show at Axpona will be the AN3 speaker prototypes; PS’ first loudspeaker, based upon the work of our friend and mentor, Arnie Nudell (prototype cabinets are shown above with PS Audio Director of Sales, Scott McGowan). The AN series will eventually feature 3 models, of which the AN3 will be the smallest and least expensive. The AN3s will be followed, logically, by the AN2 and AN1; the AN1 will be a massive line-source loudspeaker designed as the ultimate expression of Arnie’s work, and a fitting replacement for and successor to the Infinity IRS Vs, which have served as our reference loudspeakers for years, and which are the benchmark against which all aspirants to SOTA status have been measured. Excitingly enough, there will also eventually be three models of Stellar loudspeakers, designed to emulate the sound quality of the AN series, at lower price-points. 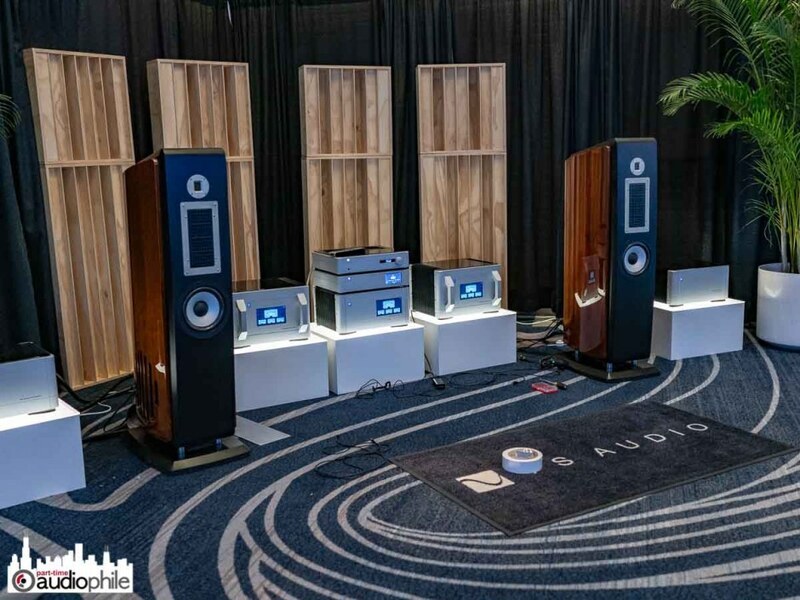 True to PS Audio’s tradition of providing industry-leading performance at moderate prices, the AN3—projected to retail at $12,000-$15,000 per pair—will provide the technology and performance normally associated with $40,000+ loudspeakers. The AN3 is a 4-way system: starting at the bottom, there is a servo-controlled high-excursion 12″ aluminum cone woofer with 700 watts of dedicated amplification; an 8″ servo-controlled aluminum-cone midbass coupler also has 700 watts of built-in amplification; the midrange driver is the superb Bohlender-Graebener Neo 10 planar transducer; the tweeter is an AMT whose response extends well above audibility. An identical AMT tweeter is mounted on the rear panel of the enclosure. Amongst the AN3’s unique features are level controls for the subwoofer and midbass coupler, and DSP used to set subwoofer level in-room with use of a provided test source and microphone. Proprietary to the AN3 (and patent-pending) is a Perspective Control which will allow the speakers to produce a convincing soundstage, no matter how closely they’re positioned to a wall. AN3 cabinets feature a laminated front baffle of multiple layers of HDF assembled into a constrained-layer-damped construction totaling 2″ thickness. Side panels are 1′ thick HDF; the subwoofers are side-mounted on the outside panels of the enclosures. A variety of interchangeable trim panels will be available, including walnut and gloss black. AN3s weigh approximately 160 pounds each; dimensions are roughly 49″ high x 20″ deep x 13″ wide.The system impedance is nominally 4 ohms, and sensitivity is roughly 90 dB. Find more at the PS Audio website.